Lean Thinking: Why a Book of Stories? Why take a risk with something so different? Isn't this kind of book, with its original artwork & design, expensive to produce? It's important to take risks. My job is to push myself, (and you), out of our comfort zones. Give without expecting a return. I wrote Reflections out of pure enjoyment, without any expectation of a return. When you send things out into the universe, I believe it repays you -- often with compound interest! Life is short -- challenge accepted thinking! Make a decision and follow through without fear of failure. Are business readers incapable of reflecting deeply? Do they 'just want answers'? I don't buy it. All my books are full of questions & reflection points, yet nobody has ever complained. On the contrary, people form study groups. Hansei -- self-reflection with humility & a commitment to improve -- is central to Japanese culture & to the Toyota Production System. 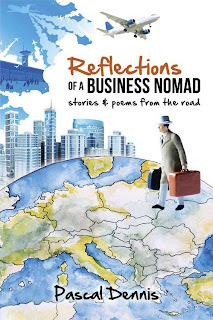 Hopefully, Reflections of a Business Nomad can help in some small way.